Cape Breton Tourism Spotlight: The St. Peter's Community Club is Proud to Present the Theatre Production "The Wake" featuring the Nicolas Denys Museum Players on February 17th, at 6:30pm. 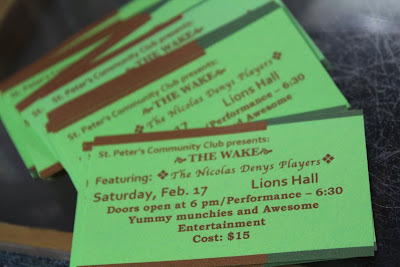 The St. Peter's Community Club is Proud to Present the Theatre Production "The Wake" featuring the Nicolas Denys Museum Players on February 17th, at 6:30pm. Looking to chase away the February blues, look no further take in The new production "The Wake" from the Nicolas Denys Museum Players. They talented actors are sure to lift your spirits with their hilarious new show. The 1st. show on February 10th, is already sold out. But do to the public demand a second show will take place on February 17th. Tickets are now on sale. The St. Peter's Community Club is proud to present the Theatre production "The Wake" with the Nicolas Denys Museum players. Some tickets for the second show with yummy munchies and awesome entertainment at the St. Peter's Lions Hall starting at 6:30pm are still available. Tickets can be purchased at C & M Video St. Peters — with Michele Bernice Stone, Clair Rankin, Gloria MacDonnell, AL Calder and Shannon Stone. For a fun filled evening of entertainment make sure to get your tickets, before they are all gone.